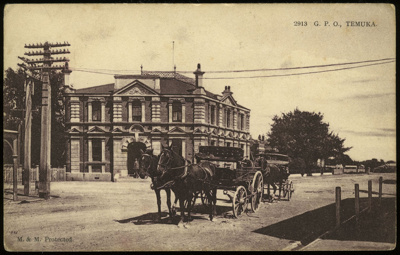 Postcard featuring the General Post Office, Temuka, circa 1903-1905. Depicts two two-horse buggies parked in centre of shot, opposite the Post Office in the background. The title "2913 G.P.O., Temuka." appears in the upper right corner while the photographers' redit "M & M Protected" appears in the lower left corner. Unused with standard divided verso.